Welcome to the authorised website for the rather excellent Griff Rhys Jones, comedian, actor, presenter, author, champion of architecture ancient and modern and general all round Good Thing. I hope you can find what you are looking for here. If there is anything you want to comment on do feel free to contact the webmistress with any updates, suggestions, queries or amendments. Confirmation, dates and more details will be posted as soon as we have them. In the meantime, all rumours unofficial and unconfirmed will be posted in the Forum and moved over here when they become official! Griff is filming a new quiz show (working title The Archive Quiz) at the BBC Tv centre. Further information and broadcast times will be posted when available! Photographer John Need has loaned us some wonderful pictures for the Gallery - please enjoy (but do not steal!) these, and have a look at his other work following the link to his site! Griff is filming for a new pair of It'll Be Alright on the Night shows. Griff is about to begin filming for a sixth Three Men adventure - further details when they become available! Some new photographs have been added to the Gallery page - thank you Griff for giving them to us! "Rivers" won Best Narrative Travel Book at the Travel Press Awards 2010 - many congratulations! Griff's appearance on the Politics Show is added to the Downloads page. Filming has started on Griff's new series on indigenous art. Updates and broadcast dates to follow in due course! Griff is not performing in Oliver! from 19-24 April. Fagin will be played in his absence by the cover, Tim Laurenti. Griff's new book, Rivers, is on sale now. Details and link to Amazon on the Merchandise page. Griff is to be awarded an Honorary Fellowship of Cardiff University on 13 July 2009. Griff is giving several television and radio interviews regarding the new River Journeys series - further details will appear as soon as possible and links added to the Downloads page. Griff has started a blog for the Civic Society Initiative. There is a permanent link posted on the Links page. Events and booksignings for the new Rivers book confirmed at the National Theatre (15th September at 6pm) and Edinburgh International Book Festival (21st August at 1:30pm). Griff visited Hadleigh today in support of the local campaign against a proposal to build a Tesco store on the riverside there. There are several new links on the Articles page and I've also added a permanent link to Hands Off Hadleigh's site on the Links page. Griff will present the Civic Trust's annual awards at the Emirates Stadium in London on 18.3.09. Here is the list of winners and nominations. The Restoration catch-up documentary is now being filmed, hopefully to be broadcast later in 2009. A second series of Greatest Cities of the World is to be filmed for broadcast later in 2009. Also, a one-off documentary catching up with the projects featured on Restoration is due to go into production soon. Griff has done a doodle for Epilepsy Action's National Doodle Day auction - do push the funds up by bidding for it! Live interview with Griff on BBC news relating to their unexpected dip in the Pacific. Griff, Jo and friends had to be rescued from shark-infested waters after their holiday boat caught fire and sank. Everyone is safe and now home, thank goodness - all best wishes to them and many condolences on the loss of the laptop! We hope you get a chance for another holiday to recover from your holiday! Here is an interview with Griff in which he talks about it, and here is his article about the experience! I have been contacted by the excellent people of the River Stour Trust as Griff has been their Vice-President since 2007. I have added a link to their site giving details of their work on the Links page and will update links to their various events as I get them. Griff was filming on the Stour recently as part of his River Journeys series, so we hope to see more of it then! If you have ever fancied renting Griff's farmhouse in Wales (as featured in the BBC's A Pembrokeshire Farm), now's your chance - here is a link to the Under the Thatch, the company that manage it. If you saw the programme you will know that this was a huge restoration project carried out by Griff a couple of years ago, and the finished result is fabulous. (There is also a link to their site on the Links page for future reference.) Griff's two properties are the ones at Trehilyn in the list on the left hand side of the page. Griff is also managing the restoration of the mill, mill cottage and a 1910 showman's waggon at Trehilyn - further news on these when I have it. DVD of Three Men in a Boat/Another Boat is available as of today. There are a few tickets available through The Applause Store for the studio recordings of It'll Be Alright on the Night on 1 November 2008. 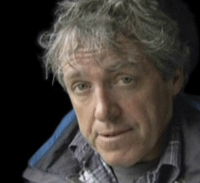 A third Three Men in a Boat series is now in production, to be filmed in October this year for broadcast early in 2009. Griff is announced as the new President of The Civic Trust, a charity decidated to campaigning for better places in the built and green environment (follow the link above for more detailed information on the Civic Trust and their work). Griff gave an interview for The Ecologist and several BBC Radio interviews relating to this - interview publication information will be added when available.